Water chemistry cannot be completely dispensed with in the garden pond either. However, you do not have to be an expert scientist, and you will find that you very quickly master the few basic principles. These include water hardness, the pH level and a little knowledge of the nitrogen cycle in the pond. The hardness of the water and especially the carbonate hardness play an important role in stabilising the pH level in the pond and are therefore two of the most important hydrochemical factors in the pond. The carbonate hardness ensures that the pH level, which we will discuss in the following, remains constant, avoiding any drastic swings which the fish and plants do not like at all. As a result of the assimilation activity of the plants and especially of the algae, which are present in vast numbers, the carbonate hardness can be reduced or even depleted, which can cause lifethreatening fluctuations in the pH level. The formation of acids (nitrate) due to over-feeding also leads to a decrease in carbonate hardness. The carbonate hardness in the pond should always be 5�d CH and can be measured using the JBL CH Test Set. Decreased CH-levels can be re-adjusted by exchanging some of the water with hard tap water or by adding JBL AlkalonCombi to the water. The pH value indicates whether a liquid reacts in acidic, neutral or basic (alkaline) manner. The pH scale ranges from 0 (very acid) to 14 (very basic), with neutral at about 7. We are constantly confronted with the phenomenon of the pH level in everyday life: e.g. Coca Cola has a pH level of approx. 3. All the food dishes which we find tasty are more or less acidic. The optimum pH level for all pond life is between 7.5 and 8.5. It fluctuates slightly throughout the day, with the level in the evening higher than in the morning. It is important to know that when there is a one point change in the pH value, the concentration of ions responsible for the change alters tenfold, in the case of two points there is a hundredfold change. This causes fish and plants great stress. For this reason, the carbonate hardness plays a vital role as a stabilising factor in the pond. The pH level can be measured using JBL pH Test Set 3.0 � 10 as a guideline, or, if more precise measurements are desired, with pH Test Set 7.4-9. In view of the fluctuations in pH levels throughout the day, measurements to be compared should always be taken at the same time of day. 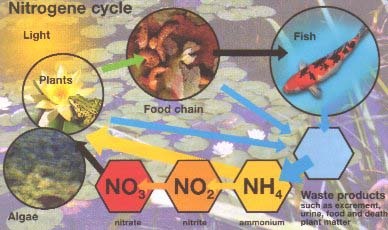 Compounds containing nitrogen enter the pond water from the excretion of the fish and other animals. One of the main sources of such waste products is the digestion of proteins, which are not used for growth. For this reason, the task of a responsible producer is to produce feeds for garden pond fish composed in such a way that as much of the proteins as possible can be utilised for growth. In special situations, where the fish can only make use of a small amount of proteins for their growth, as for example in the cold season, the feed should only contain a small quantity of proteins to ensure that the pond is not unnecessarily polluted. Both these criteria are met by the feeds in the JBL PRO NATURE CONCEPT range. However a small amount of nitrogen will inevitably enter the pond water in the form of ammonium. This ammonium either serves directly as a plant nutrient or is transformed by beneficial cleansing bacteria via the intermediate stage of nitrite to nitrate (see illustration). Nitrate, even in relatively high concentrations, is harmless to fish, but it encourages the growth of undesirable algae. It also serves as a plant nutrient. Since nitrite is highly toxic to fish, traces of nitrite should never be evident in pond water. The presence of nitrite is an indication of a major disturbance in the biological balance of the pond. Ammonium itself is not toxic, but converts to ammoniac depending on the pH value. The more the pH level exceeds 7, the more toxic ammoniac is produced. Under normal circumstances, ammonium should also never be traceable in the pond water. Evidence of ammonium is a further sign of serious disturbance in the equilibrium of the pond. In a carefully laid out pond with a marshy area, low-nutrient ground substrate (e.g. pond earth from specialist retailers) in the plant zone, sufficient gravel as a ground bed and possibly also a pond filter or running water, such disturbances should not occur - unless serious mistakes have been made in the care and maintenance of the pond. The nitrogen compounds in the pond can be monitored using the JBL NH4, NO2 and NO3 Test Sets. Greatly overfeeding the pond fish, resulting in feed being partially digested or not eaten at all. This leads to a surplus of ammonium in the pond water, which cannot be broken down quickly enough by the cleansing bacteria. Treating disease with preparations, which destroy the bacterial flora or the micro-organisms in the pond. Cleansing bacteria are destroyed and toxic nitrite or ammoniac become enriched. Feeding with feed which is too high in nutrients for the colder seasons. High-protein feeds will cause increased excretion of ammonium by the fish in the cold seasons. As the cleansing bacteria are less active at lower temperatures, the ammonium is not processed sufficiently. Introduction of fertilisers to the pond. Lawn fertilisers and other fertilising products may cause a sharp increase in nitrates, nitrites, ammoniac and phosphates in the pond.